Marketing Director Colleen Kelly oversees signing of License Agreement at the National Hardware Show. The snow has melted, the flowers are in bloom, and the spring trade show season has come to a close. Our sponsorship of the inventors’ areas at three big shows (Housewares, Response Expo, and Hardware) culminated with the signing of a licensing agreement on the floor of the National Hardware Show (NHS). 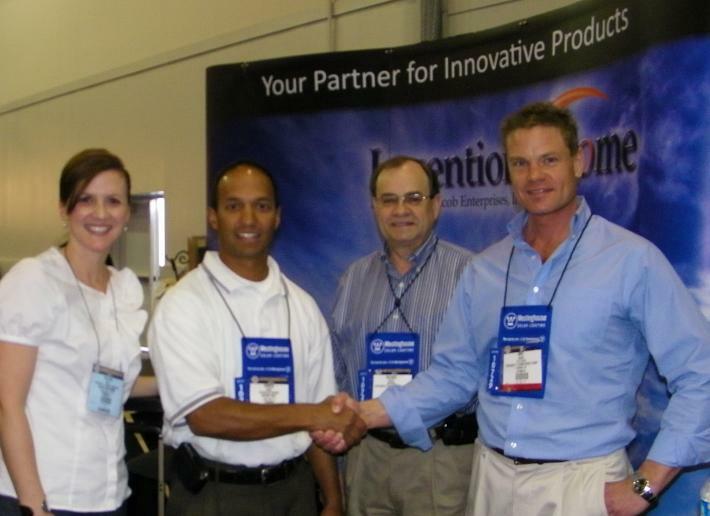 Executives from Crown Bolt met with inventor Richard Bushey at the InventionHome booth to execute an agreement for the Flip-Down Doorstop. What a great way to symbolize the exceptional value of the “show within a show”, the area on the floor where inventors meet face-to-face with companies looking for new products. Traffic at the NHS’s “Inventors Spotlight” was brisk, making the aisles difficult to maneuver at times as over ninety inventors demonstrated their products to an inquisitive audience. The InventionHome booth located at the front of the area was busy as well, showcasing a dozen or so clients’ products as the InventionHome staff met with existing member companies and new companies interested in finding innovative products. Elsewhere on the show floor, several products previously licensed through InventionHome were on display in the Licensees’ booths. These included the Bi-light, Captails, Wurkpads and the Saw Through Saw Horse. Initial response to these items has been excellent! Inventors exhibiting or attending the show were invited to a free seminar presented by the United Inventors Association (UIA). InventionHome was pleased to sponsor the presenters’ luncheon where guests included AJ Khubani, CEO of Telebrands Corp., and Dave Kappos, Director of the United States Patent and Trademark Office. The UIA also awarded prizes to inventors that exhibited for Best Product Concept, Best Market Research, and Best Overall Product. Summer will be in mid-stride before the dust from the spring shows settles. The more successful the show, the more work to do following up on product interest and company contacts when we return. The InventionHome staff is looking forward to a nice, tall drink by the pool sometime in August! Need help with your Invention – Submit your idea or call toll free 1-866-844-6512.